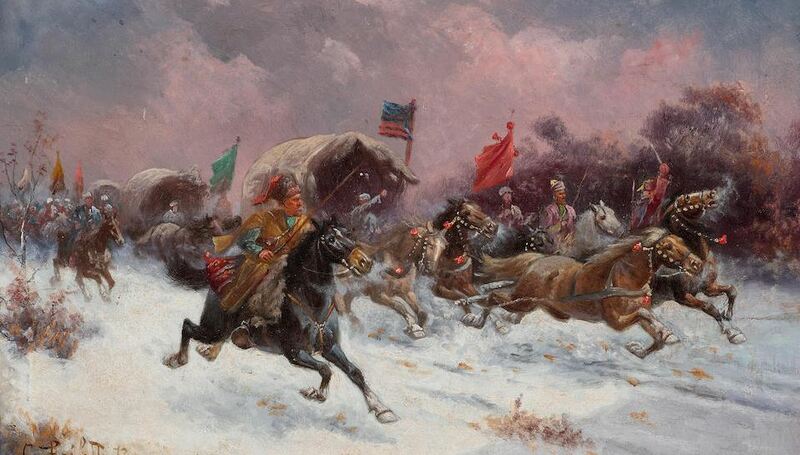 Adolf Constantin Baumgartner Stoiloff (Austrian/Russian, 1850-1924) A Fine Oil on board "Charging Warriors on Horse" within an ornate gildwood frame. Circa: 1890. Adolf Constantin Baumgartner Stoiloff (Austrian/Russian, 1850-1924) Born in 1850 in Linz (Austria) Stoiloff died in Vienna in 1924. According to a research of Russian literature, he studied in the 1880s at St. Petersburg Imperial Academy of Fine Arts. He was very well known for his russian horse and hunting paintings. In 1890s-1900s his Russian scenes with cossaks and hunters were frequently reproduced in various European magazines. He is known to have worked under various pseudonyms signing his paintings with "A.Baumgartner-Stoiloff" , "Stoiloff", "Constantin Stoiloff" or "C.Stoiloff"
Born in 1850 in Linz (Austria) Stoiloff died in Vienna in 1924. According to a research of Russian literature, he studied in the 1880s at St. Petersburg Imperial Academy of Fine Arts. He was very well known for his russian horse and hunting paintings. In 1890s-1900s his Russian scenes with cossaks and hunters were frequently reproduced in various European magazines. He is known to have worked under various pseudonyms signing his paintings with "A.Baumgartner-Stoiloff" , "Stoiloff", "Constantin Stoiloff" or "C.Stoiloff".